More than 480 kits will be rolled out across ACT Policing over the next year. Photo and video: George Tsotsos. 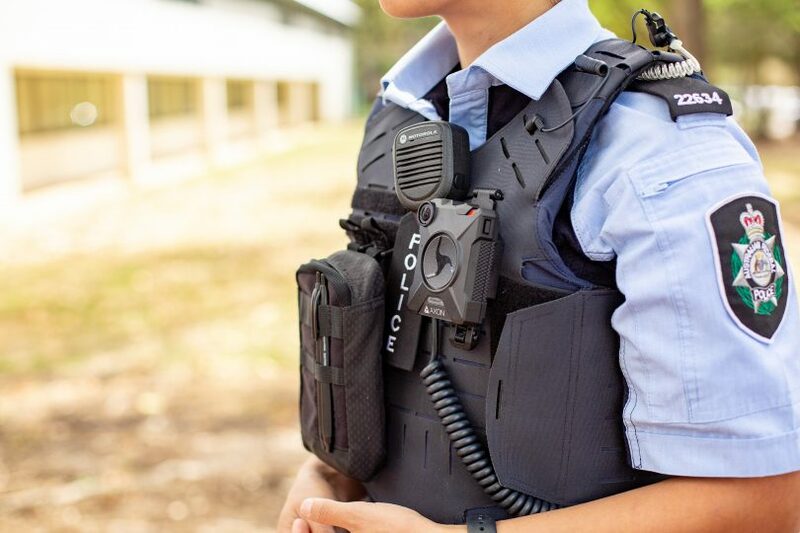 For the first time in the ACT, starting from this week police officers will wear body cameras that will be activated as soon as an officer pulls their firearm or taser gun. More than 480 kits will be rolled out across ACT Policing in the next six months, as a result of a $2.7 million injection of ACT Government funding over four years, with general duty police, traffic members and criminal investigation officers to use the kits. Whenever a taser or firearm is drawn from its holster, all body-worn cameras in close proximity are activated, recording multiple views of the incident. Previously, tasers did have a video and audio capability but the new kit will have separate body-worn cameras. More than making day-to-day work safer for officers, Deputy Chief Police Officer Michael Chew said the equipment will lead to quicker compliance by offenders and ultimately provides unbiased, factual information about an incident. Deputy Chief Police Officer Chew stressed that the cameras would only be in use when an officer draws his/her weapon, but said it is ACT Policing’s intention at a stage in the future to open it up to broader use of the cameras. “These camera systems are worn separately, on the officers’ uniform and provide significantly enhanced recording and functionality,” Deputy Chief Police Officer Chew said. Deputy Chief Police Officer Chew said other benefits included spending less time with written statements, the quality of evidence presented in court, and providing better protection for police against excessive use of force claims. Starting this week, ACT Policing officers will wear body cameras that will be activated as soon as an officer pulls their firearm or taser gun from its holster.Whenever a taser or firearm is drawn from its holster, all body-worn cameras in close proximity are activated, recording multiple views of the incident.Watch the police training footage from the body-worn cameras in the video below. ACT Policing’s 2017-18 annual report revealed a 342 per cent increase in use of force reports in relation to tasers compared to the year before, with 199 reports – up from 45 – in 2017-18. The report suggested the increase in taser use of force reports could be attributed to more police officers being issued the weapons. Deputy Chief Police Officer Chew said increasing body cameras and tasers should not be a concern to the public. “The use of a taser is one of our less-than-lethal-force of options, along with our OC spray, our batons and our handcuffs,” he said. They should have the protection of body cameras and microphones at all times. The police do such wonderful work, a lot of which goes unnoticed. They deal with dreadful situations all the time. Thank you to all the Police. I'm chuckling at some of the comments here urging every police action to be recorded, citing potential police misbehaviour. Here's a suggestion: next time you get stopped for a traffic offence, jump out of your cap with your IPhone and tell the officer loudly you're recording every interaction (you're entitled to do so). It may well be that he was originally thinking of giving you a friendly warning about your faulty brake light or to remind you informally that you failed to indicate. Instead you'll find yourself with a traffic infringement notice (or notices), loss of points, and quite possibly a defected car. In recent years. I’ve filmed all my encounters with police, Martin. In my experience, it’s an excellent method to ensure that officers remain polite and professional (this is in stark contrast to behaviour I’ve witnessed from police when my camera has not been running). Matt Donnelly Sorry, Matt, but I find that hard to believe. Don’t feel sorry, Martin. You’re entitled to be sceptical. I invite you to visit youtube channels like Copwatch, PINAC, Crimebodge, and the myriad of First Amendment auditors, to see for yourself how filming interactions with police aids in accountability and public safety. Respond to a call out they should be activated. No point seeing what happens after the other 3 warnings or instructions have been given. Sure not on all the time but as soon as you are engaged turn them on. It protects the force from false claims. And protects the innocent from corruption. Tasha Krahe why? Sitting in the patrol car "Geez, I've got an itchy arse today" I'm sure that's critical information. So when a police officer is greeted by you children out at the shops, you want it recorded? When someone approaches a police officer for directions, you want it recorded? Some poor victim in a crash is being comforted by police and it should be recorded? I could go one but it's not necessary to have it on. Those ones can be deleted, I am sure. But I think for everyone's peace of mind, recording everything is good. You never know when a simple act can escalate quickly. You would have to create an entire new department dedicated to the management of this audio. What a waste. That is just ridiculous. Going to the police station to report a minor accident and have your conversation filmed and recorded - seriously? Asking for directions at the same foyer? Doesnt that just keep everyone safe? That's never going to happen and shouldn't. Why rely on the police to record your interactions with them? We are well within our rights to film police going about their duties in public, and I recommend doing so for our safety and their accountability. Martin, as Matthew has already pointed out, public areas of a police station already DO have audio and video recording. You may request footage, may! Will you get the footage, that's a completely separate issue. For any public engagement? No. A police officer goes out to grab their lunch, a coffee, this is engaging the public and no need to be recording it. Matthew Dickson No all interactions at police stations are *not* recorded. David Murn No they do not.